Tyson stands at a height of 5'8". He has black hair and dark hazel eyes. His complexion is fair and seems to be of a somewhat athletic build. One often notices his piercing-studded ears, which are perfectly accompanied by his cold gaze. 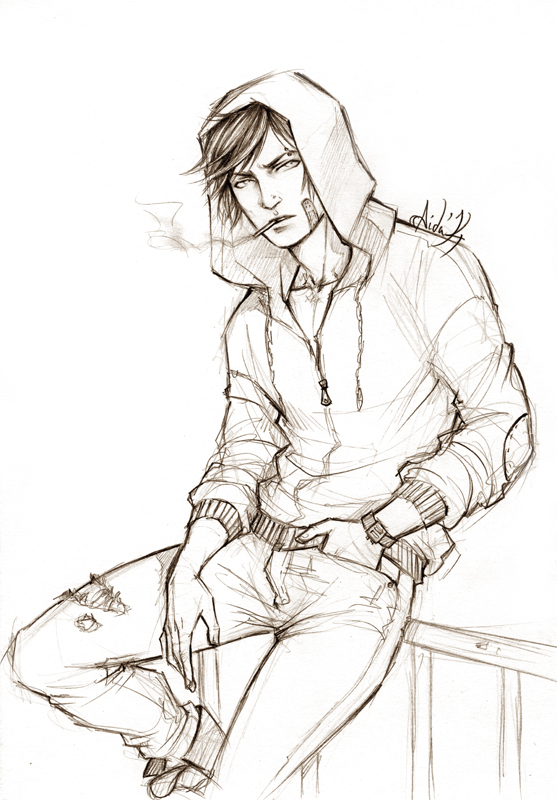 He wears a simple grey hooded jacket, slightly tattered jeans, and brown leather boots. Backstory including death: Tyson was one of the brightest minds in his graduating yea from high school. Tyson had no problem getting into a university and, by the insistence of his parents, pursued a law degree. Tyson's future looked bright however, one thing he seemed not to know was what he really wanted to do. Law was a challenge to Tyson, and with each passing moment, he got tired of it and ignored his studies. He only aimed for passing he requirements, satisfied with a barely passing mark. He never wanted to do law but if it would get his parents of his back, he was satisfied on finishing the degree in whatever way. He made friends, or at least people who would keep him company so he would not feel so alone. He got into their habits and even adopted their outfits. He was not really sure why he was with them or why he was doing this to himself. He just knew that it was important to know people who could be of help for you to get to your goal. His goal was just to make it out alive of his law degree. Sadly, fate had other plans for him. While he and his friends were hanging out in a tower, his foot slipped off on of the bars he climbed on and fell to his death. Tyson lingered between life and death. He looked at the people he hung out with, genuinely concerned for him as they tried their best to revive him. They were crying bawling out their eyes as they wish for him to come back to them and never leave them. He watched as his parents receive a phone call from them alerting them about his fatal fall. Tyson never really understood how he was supposed to live his life, or what he was even supposed to do with it. before his fall he thought no one really cared what he did, that his life was his own to do whatever pleased him. Now he realised, if he can't live his life for his own, he should live it for the sake of the those who cared for him. and with the wish to live again he woke up in Newwood. Entree fee: Tyson had always ever cherished one thing in his life, his childhood. Those days seemed to keep him from faltering whenever he dwelled on the lack of goals in his age. He found a safe happy place in his childhood,by reliving it in his mind. He remembered his innocence, his joyfulness, and how bright everything looked back then. If Tyson wanted to live his life for those who care for him now, he would have to give up the happy memories he had in the past in hopes of making new ones in his present life. And so he paid the price of losing all his childhood, everything he knew, everything he remembered, and everything he was happy about as a child. make your appearance a bit longer, it's currently 56 words while it needs to be 100 then I'll accept it. Editted. Let me know if it is acceptable. Do not hesitate in telling me what I could put in or improve in this sheet.